A passion for information, and determination and commitment have lead to Palmerston student Lyn Grevsmuhl being nominated for the 2007 DEET Vocational Student of the Year Award. Lyn balanced her studies with a 22-year-career as a public servant with various government departments and organisations. A love of books led her to studying and a change in career path, enrolling in a Diploma in Library and Information Services in 2004. She maximised her studies through work experience and training opportunities in a variety of library environments. A career highlight includes setting up a library for an Indigenous medical organisation. Nyree Terry, Campus Administrator, Palmerston, said Lyn was an inspiration to others living their passion through study and experience. ‘It has been her extraordinary quest for knowledge and inbuilt determination to do her very best in whatever she applies herself to that has led her to be nominated for this award,’ she said. 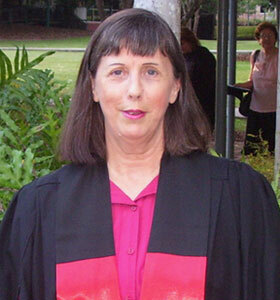 CDU lecturer in library studies, Kaye Bartlett said Lyn’s personal skills, mature outlook and confidence were reasons for her success.